PPHS sophomore Joel Beattie (37) fights for yards after a catch, during the Big Blacks’ bout against Pikeville on Friday in Point Pleasant, W.Va. They really enjoy having Wendy’s in town. 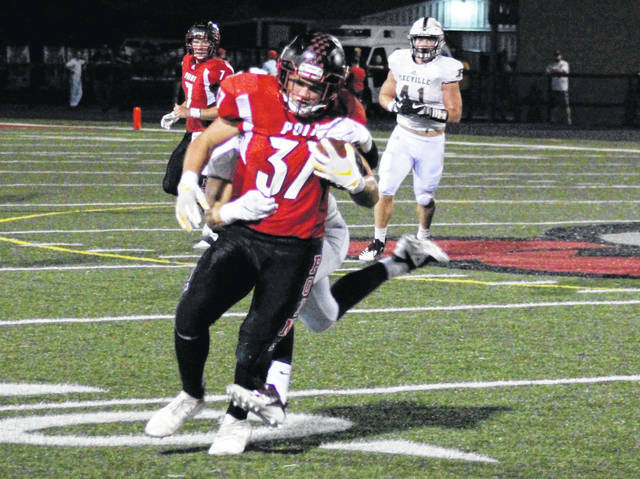 The Point Pleasant football team remained unbeaten while also improving to 2-0 in televised regular season games following a thrilling 41-34 victory over visiting Pikeville in the Week 5 Wendy’s Friday Night Rivals Game of the Week at Ohio Valley Bank Track and Field in Mason County. The Big Blacks (5-0) — who sported red uniforms for the second time in three weeks — led 14-0 after one quarter of play, but the hosts found themselves in a 21-14 deficit midway through the first half before tying things up at 21 at the break. Both teams continued battling back and forth throughout the duration of the second half, but the Big Blacks ultimately did enough down the stretch to maintain their unbeaten mark. Facing a fourth and goal inside the four, Point Pleasant’s defense held as Jovone Johnson deflected a pass that resulted in a loss of downs. PPHS ran out the clock to preserve the seven-point decision. The Van at Hannan contest from Friday night had not yet gone final by press time. In what was to be a battle between winless teams, Wahama’s TVC Hocking game at Federal Hocking was postponed until Monday due to lightning. Kickoff has been scheduled for 6:30 p.m. The White Falcons return to action Friday when they host Eastern in a TVC Hocking contest at Bachtel Stadium. Kickoff is scheduled for 7:30 p.m. Both Point Pleasant and Hannan have byes over the course of the next two weeks, with one being a scheduled bye and the other is an open date on their nine-game regular season schedules. Both programs return to action in Week 8 as the Big Blacks travel to Meigs for a 7 p.m. Friday night contest, while the Wildcats travel to Montcalm for a 7:30 kickoff on Oct. 12. Due to an early deadline, the Mason County football games from Week 5 will be available — if information is received — in the Tuesday sports edition of the Point Pleasant Register. Game stories will be available online at mydailyregister.com before appearing in print.